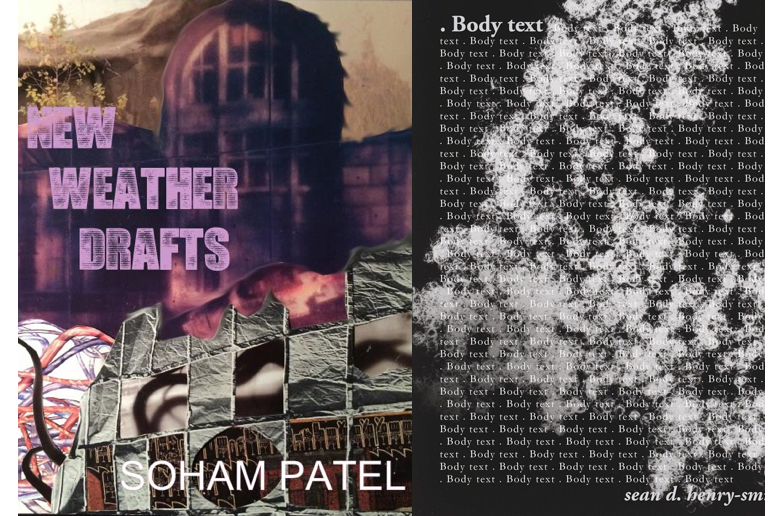 This month I reviewed two new chapbooks, Soham Patel’s New Weather Drafts and Sean D. Henry-Smith’s . Body text. These chapbooks have lots in common with each other. But there’s no overarching theme to the column this month. I want to see how these works intersect, without planning their intersection ahead of time. I want to leave space for the unplanned, the accidental. That said, I think each of these chapbooks want that too. In their collective engagements with racism, misogyny, environmental degradation, and imperialism, they ask a persistent and essential question: how can the future be different? how can it break with the present? how can it be something else, something other than a version of what we already have—except, more awful? The trajectory of the poem suggests an underlying link between these disasters and between these acts. In what sense, for instance, is the pharmacist a representative of the police? Patel does not answer these questions: rather, she makes the poem a place to stage such questions, and invites us to collaborate with her in producing an adequate set of answers. “I can save no one,” writes Patel at the end of one poem. Her poetics are documentary: she catalogues and critiques with precision and energy, and she invites us to join the project of her critique. d One wore a wig. ‘til cerulean blue, then spin. The very presence of these bodies, undressed, remade according to their own (queer) logics, opens the possibility of transformative pleasure—a way to leave the body and the world behind. If this possibility is aspirational, the poem nonetheless helps us to name it, to say what it would look like. 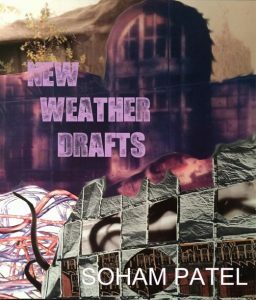 “Where will we stay when our insides break,” Patel asks in one poem: the poem itself might be one such place of refuge, a place where the damage of imperial violence can be remediated through acts of radical imagination. “My body has / not been predicted,” she writes, and this feels like a declaration of resistance and autonomy, a rupture within (and from) the lockstep logic of capitalist history. A colleague has said this to me: I love the spices, teach me yoga, my dream is to ride an elephant, take me to where you come from and make me cry? So now I know some belonging comes by way of curiosity only. I am reminded of what I am (not): _________________________________________________. 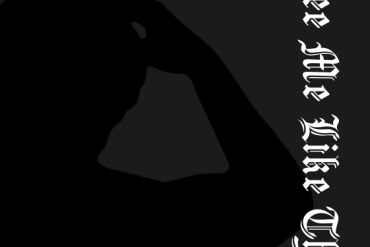 Can the body be a text? Can a text sustain the body? Selected by Lucas de Lima for the 2015-2016 New Delta Review chapbook prize, Sean D. Henry-Smith’s . Body text takes up these questions of survival—the survival of the past and the possibility of the future. . Body Text is Henry-Smith’s first publication as a poet. It thus serves as an announcement for a program: an embodied manifesto, which devours and refashions language for its own political and literary imperatives. And it shows Henry-Smith to be a poet who uses language as one material among many. Punctuated by his ghostly black and white photographs, . 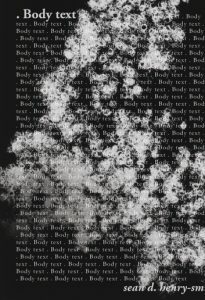 Body text raises questions about the relationship between text and body across several media. 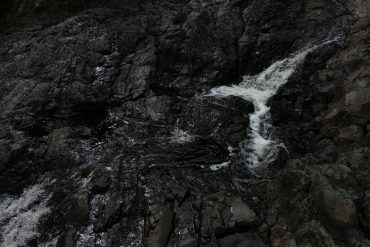 It asks us to consider the different ways in which poetry and photography relate to the body, to imagine the sites of crossing and collaboration between these arts. Henry-Smith also leverages the materiality of the chapbook. The book’s center-fold, which pulls out to four full pages, is covered in the repeated phrase “ . Body text”—the words cut off at the edge of the final spread, suggesting indefinite repetition, repetition which exceeds the frame of the book. (The centerfold closes with a brief commentary: “Landscape feast of tongue, let all reap monogram in flesh wrap. You pray to endure the night; I pray to outlast the archive”). Here, his writing literally ruptures the frame of the book—and with it, the archive and its institutional imperatives. Similarly, the cover of the book is embossed with its title, over and over again, a continuous field of body and text, which covers it from top to toe. These embossed words are more or less illegible, obscured by the cover image (a photograph from Henry-Smith’s series Mad Cloudy, The Cosmos OR From Forth Follicles, Born Galaxies OR This Ain’t Yo Mama’s Event Horizon). But in order to read the book, you have to hold it: your fingers continuously run over the raised edges of the text. In this way, Henry-Smith’s writing becomes palpable and sculptural without, however, leaving the signifying capacities of language behind. This continuous, embodied contact with textuality reminds the reader that the text itself is a made object, an object with a history, an object in history. Further, it raises fundamental questions about the relation between reader and text: it reminds you that your body is in relation to the book, and that there is a politics to that relation. In its material construction, . Body text challenges you to articulate that relation. We should pause to savor the pun on “Black magic”: like John Keene, in his recent collection of stories and novellas, Counternarratives, Henry Smith locates black excellence in counter-practices, occult methods which escape and exceed the straight-jacket of white science and epistemology. The poem begins with a choir, many voices joining together to produce such black magic. It ends, however, with a declaration of failure, a failure to bring that community into full, bodily being: “this séance won’t bring back the dead but don’t stop me from trying,” Henry-Smith writes. The poem charges down the page, an extended unpunctuated sentence. To read it aloud requires a virtuosic abundance of breath. Yet the poem’s pacing suggests panic, terror, and pursuit: the impossibility of safety in a murderously white world. 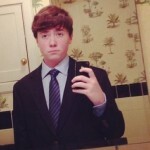 “My very breath is a protest,” Henry-Smith writes. The precariousness of black breathing is also the source of its political power, its capacity to defy the killing force of racism. The singular “my breath” opens immediately into a scene of communal breathing: “one hundred” using their breath to proclaim their capacity to survive. Unlike the séance that opens the book, this poem ends with communal possibility. Whether or not Henry-Smith can “bring back the dead,” his insistent attempt makes a future possible, a future in which it is possible to say “we” and to insist on the persistence of that we. In this sense, . Body text is as much an augury as a séance. Henry-Smith summons the history of the black avant-garde; in turn, his occult communication with the past provides “fuel for the journey Elsewhere.” As his poems bend backward into the history of the black avant-garde, they map out a path forward, a precarious future, hemmed by racist violence and speaking in its face.